JACKSONVILLE, FL, Nov. 08, 2018 (GLOBE NEWSWIRE) -- Drone Aviation Holding Corp. (OTCQB: DRNE) (“Drone Aviation” or the “Company”), a manufacturer of tethered drones and lighter-than-air aerostats today announced that its FUSE Tether System (FUSE) has been utilized by additional state and local law enforcement to enhance security at a growing number of large public outdoor events and venues for day and nighttime operations. 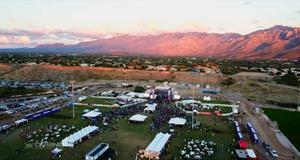 Drone Aviation's FUSE Tether System deployed at a large music festival by the Oro Valley Police Department. The Oro Valley Police department in Arizona has completed several operational flights utilizing FUSE, highlighted by its use at a large outdoor music festival attended by over 8,000 music fans. To learn more about how the FUSE Tether System can assist law enforcement and public safety organizations at large outdoor events, please find a new informational video at the Company’s website here or at Drone Aviation’s YouTube channel. On October 31, 2018, Drone Aviation’s FUSE Tether system was utilized in a nighttime operation during a major Halloween festival by a South Florida Police Department in a test to evaluate the effectiveness of several new crowd safety monitoring technologies including persistent tethered unmanned aerial systems. The FUSE Tether System is powered by a proprietary mix of hardware and software in a customized power pack and an Automated Smart Tension Control Winch Case with 200 feet of tether supporting 110-volt ground power sources such as portable generators. With the FUSE tethering system, DJI M200 users can dramatically and cost-effectively increase drone flight time with uninterrupted power from the ground while benefiting from improved safety. Safety is enhanced by FUSE’s use of an onboard backup power pack and tether connected to the Company’s proprietary automatic tether tension management system. FUSE is based on the same military-grade advanced technology utilized in the Company’s tethered products sold to the U.S. Department of Defense. To learn more about Drone Aviation’s tethered products and technology including product videos, please visit www.droneaviationcorp.com and follow us on Facebook, Twitter, Instagram and YouTube.